“Even as a child I had a relationship with film as if it were a church. It was a God-given territory upon itself. You can't watch a film without wanting to be saved. It's a meeting with the living light. The light works with you as you work with it. I would like the film to answer the need for community - to show how people are tied together, sometimes paradoxically." In a striking sequence of Jean-Luc Godard’s Vrai faux passeport, which the filmmaker has chosen to describe as “a documentary fiction on the occasions for passing judgment about the manner in which films are made,” two different ways of filming poverty are being compared. First, we recognize a fragment from Chantal Akerman’s D’Est showing a long tracking shot gliding past a line of people standing in the snow at a Moscow bus stop, waiting to sell things. 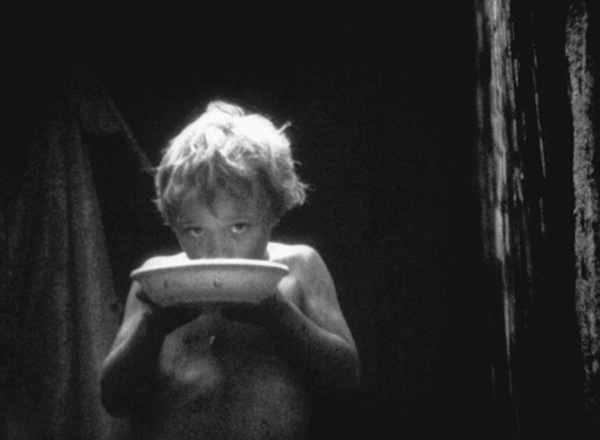 Then a fragment from another film appears, showing an elderly woman with a crooked back pulling a large trunk behind her, before cutting to a shot of a blind boy begging in the streets. A voice-over recounts how, in order to survive, the woman would allow her back to be kissed for money, and that the boy has been told by his parents, who are also blind, that everyone in the world is in fact blind, that no-one can see oneself. Godard, always the examiner, gives the first approach an all-too-severe “malus,” while appraising the second with a “bonus”. While the former approach tends to over-stress the will to art, he says in a commentary, the latter shows no compunction whatsoever, which makes it much more grandiose and frightening. Where does this mysterious piece of cinema, with its handheld shot, overly-contrasted black-and-white images and this haunting, solitary voice-over narration, come from? It is taken, so we learn, from a film titled Ladoni (Palms). It was the graduation film of a student of the famous Moscow All-Union State Institute, whose name is Artur Aristakisyan. We learn that the footage of Palms was collected over the course of several years after the fall of the Soviet Union and Moldova’s independence, during which the filmmaker lived amongst the outcasts and marginalized of Kishinev, the capital of Moldova. The film's "heroes" are a woman who has been lying on the ground for over forty years, fighting her own struggle against the system; a young man who has escaped from the mad house, shrouded in silence till the day when people will have exhausted all combinations of words; a legless man roaming the city on his knees, fortune-telling about the girl he once loved; the hunchbacked old woman who keeps the head of her beloved hangman in her trunk; the blind beggar boy who has figured out that all people are women, throwing coins at him for being a man; a mute old man who believes that the state of Israel lies within the borders of his house, collecting a pile of rubbish so that it can reach the sky... In recounting these parables, Aristakisyan addresses his yet unborn son, offering him a path to salvation, the path of sacred “madness.” An anarchic messianism pleading irrationality as an escape from the rational structures that define our waking lives? A gnostic mysticism that finds hope in a transmigration of souls and a resurrection of bodies at the price of deprivation? Whatever sense we find in its delirious message, rare are those truly “grandiose and frightening” films that leave you with the conviction that, against all odds, you haven’t seen anything yet. That the shudder of awe and wonder has never left cinema. Palms is Artur Aristakisyan's verbluffende portret van mensen die in de marges van het leven en buiten de samenleving bestaan. Aristakisyan brengt ons dichterbij in een spirituele, hallucinante en visionaire film. “Mijn zoon, hier ben ik, je vader…”, de regisseur probeert als verteller met zijn ongeboren kind te communiceren en vertrekt op een reis langs verschoppelingen die troost vinden in een leven in de schaduw, buiten de politiek-economische systemen, die individuen neerslaan en mensenmassa’s creëren.